“Orta-Water-Fluvial Intervention Unit,’’ part of the Ortas’ “Food-Water-Life’’ exhibit. MEDFORD — When Argentine artist Jorge Orta moved to France in 1984, the culture shock was like ice water in his face. In Argentina, he had been a guerrilla artist, aiming for social engagement and agitating for political change. In Paris, he discovered a commercial art world with no social agenda. Orta, one-half of the artist duo whose work is on view in “Lucy + Jorge Orta: Food-Water-Life” at the Tufts University Art Gallery, makes that point in an interview in the show's catalog. Studio Orta, as the team is also known, stages performances and makes functional sculptures that address urgent societal issues such as climate change, hunger, access to clean water, and the repercussion of war and international discord. The Ortas follow in the footsteps of Joseph Beuys, who coined the term “social sculpture,” meaning objects that activate the people and the space that surround them. These can be as much performances or events as they are sculptures. 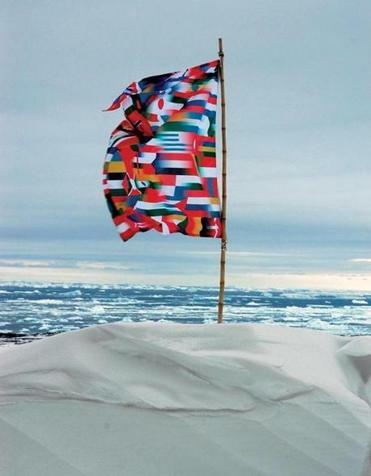 The Ortas’ “Antarctic Village-No Borders,’’ in which they constructed a banner out of the flags of several nations. Many of Studio Orta’s projects are hugely ambitious, and while earnest, also infused with playfulness and whimsy. For the 2005 Venice Biennale, they devised “Drink Water!” to highlight the growing pressure on fresh water supplies. They created a water purification machine full of tubes and vessels, and cleaned up water from the Grand Canal, then served it in glass bottles to gallery visitors. Their project “All in One Basket” involved an open-air buffet in Paris featuring fruit and vegetables that local markets had tossed away. Most of the works on view in this show, which was curated by the independent team of Judith Hoos Fox and Ginger Gregg Duggan, are scrappy, Rube Goldberg-like contraptions that would do any survivor well after Armageddon hits. 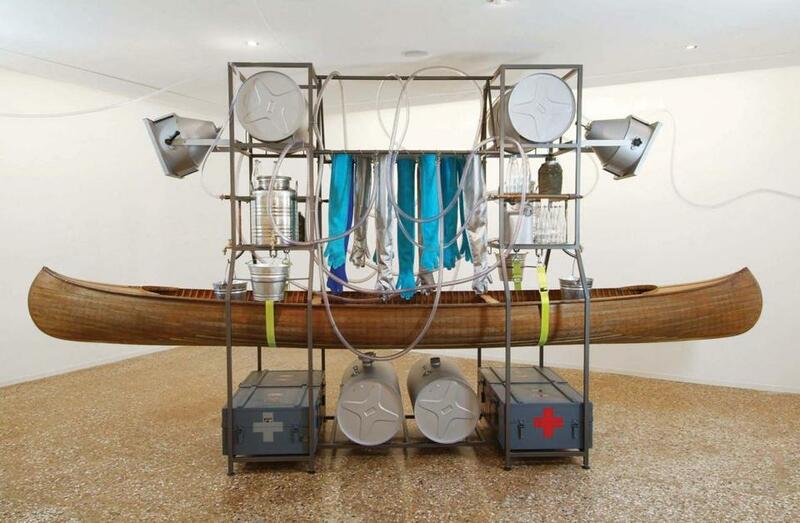 “OrtaWater — Fluvial Intervention Unit” is built around a canoe, with Red Cross packs and water drums, buckets and bottles, looping tubes and gloves that hang in the middle like curtains. These are made to operate: to carry and clean water, for instance, or, in the case of “Mexican Kitchen” and “HortiReycling Enterprise, act II — Conservation Unit,” to gather and prepare discarded food. “Mexican Kitchen,’’ part of the Ortas’ “Food-Water-Life’’ exhibit. These objects — the Ortas think of them as machines — are relics of past performances. Taken out of service and made into sculptures in a gallery, they lose much of their vitality. Imagine the experience of sipping water from just one of the water units in contrast to wandering among several such objects, feeling thirsty, with nary a drop to drink among all the sculptures. The schism that Jorge Orta experienced in 1984 between activist art and commercial art comes down, for the viewer, to the gulf between getting swept up in a social event and standing alone, contemplating an object. If relics of the Ortas’ happenings are to succeed as museum pieces, they must, in their inactive state, command that one-on-one engagement. I wish they did, because what they have to convey is so important, but they don't. They are too alike: a bunch of elaborate gizmos and gimcracks. A two-channel video of Studio Orta's daring project “ Village — No Borders” helps things a bit. The 1959 Antarctic Treaty deems that continent forever free from international strife, and a site for international cooperation in scientific research. In 2007, the Ortas launched an expedition there. They constructed a banner out of the flags of several nations. Fifty domed tents were put up, draped with the flags and with gloves bobbing like waving hands. They gathered scientists working there to take part in a soccer match; everyone wore the flag, so nobody could tell who was on what team, or who played offense or defense. Finally, they set up a do-it-yourself passport office, on view here, as “Antarctica World Passport International Delivery Bureau.” The bearer of that passport can travel the world in return for being a responsible citizen. The video of Studio Orta mounting their completely metaphorical, wildly colorful and sweet global village in the bitter conditions of Antarctica effectively conveys their agenda. They call it the ethics of aesthetics: As artists and citizens of a world in trouble, they have an obligation to wake viewers up to the issues, without being overbearing or scolding. Their work is remarkably upbeat, given its frightening topics. But for all the objects involved, the performance is central. It will more likely trigger action on the part of viewers. 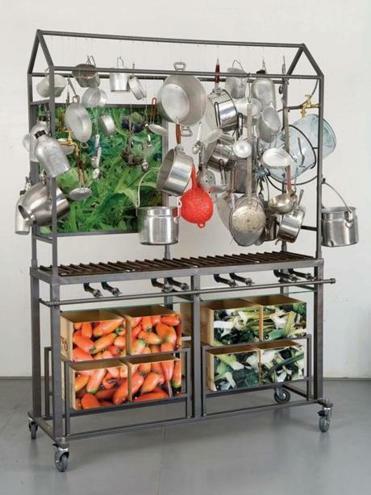 The gallery will be holding workshops in October in urban homesteading, pickling, and foraging. These fit with the Ortas’ themes, but they don’t engage directly with the work in the gallery. Performance and community is intrinsic to the Ortas’ art, and it’s not accessible in the objects alone. Programming is key. Tufts should, at the very least, host a meal made with food found on the foraging tour.